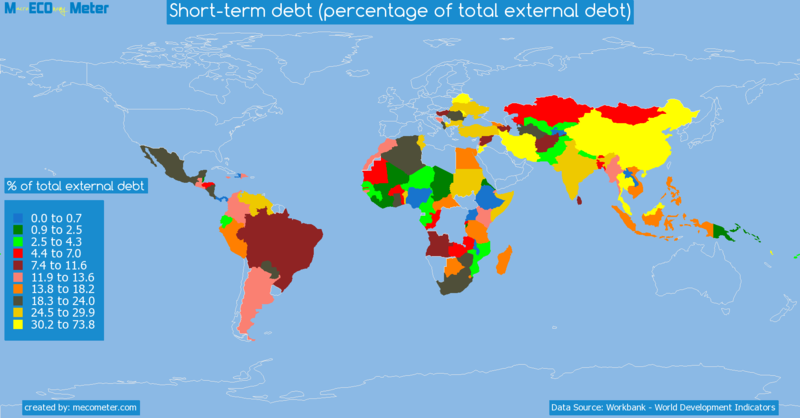 Value & RankThe Short-term debt (percentage of total external debt) of Mauritius is 64.1 (% of total external debt) with a global rank of 4. 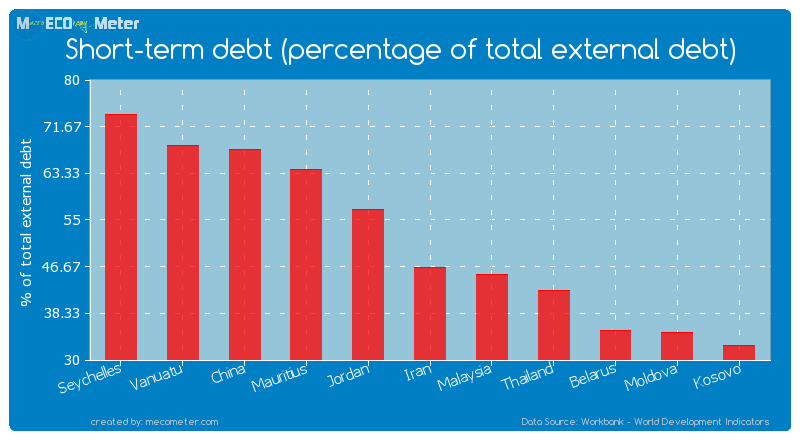 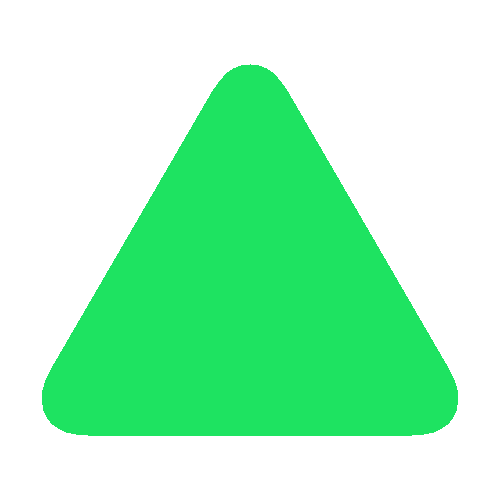 Mauritius compared to other CountriesThe Short-term debt (percentage of total external debt) of Mauritius is similar to that of Seychelles, Vanuatu, China, Jordan, Iran, Malaysia, Thailand, Belarus, Moldova, Kosovo with a respective Short-term debt (percentage of total external debt) of 73.8, 68.2, 67.6, 56.9, 46.5, 45.2, 42.4, 35.3, 34.8, 32.6 (% of total external debt) and a global rank of 1, 2, 3, 5, 6, 7, 8, 9, 10, 11.21 years growthMauritius's Short-term debt (percentage of total external debt) had a positive growth of 15,925 (%) in the last 21 years from (1991 to 2012). 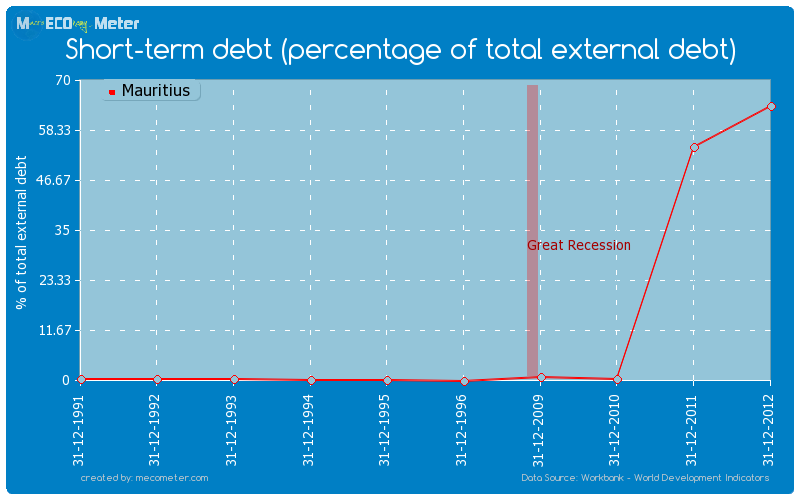 Last 21 years averageMauritius had an average Short-term debt (percentage of total external debt) of 11.0 (% of total external debt) in the last 21 years from (1991 to 2012).